With landlords building insurance for flats being typically the most expensive budgetary item each year, isn’t it important to know as much as you can before making a decision on which policy to accept? In this blog post you will find out what everything you need to know about landlord building insurance, what is covered in your policy, how to get the most competitive price and how to make a claim. We will also give you advice on how Strangford Management manage our client’s insurance requirements, providing them unrivalled block management London. Now that we have covered what risks are covered in building insurance for flats, let’s take a look at how you get a policy. What information do I need to have to get a landlord building insurance policy? Sum Insured: This is the total cost for the complete rebuild of the building should it be destroyed. You can find this on a previous policy or you may need a surveyor to provide an accurate valuation to ensure you are not underinsured (note – if you are underinsured, you may foot the rest of the bill to rebuild the property). A claims history for the last 3 years: This is important as put simply, the more claims, the higher the premium as the property is deemed a higher risk based on its previous record. What the building is made out of: Again, this comes down to risk. Compare for instance a brick and block built building vs a building made predominantly of wood. You would agree that the riskier building in that comparison is the wooden built property and therefore the cost to insure the building would be naturally higher. Location and size of the building: Location of the building may be important, if the building is in a flood risk area for instance. The size of the building simply means there is more to go wrong and therefore, again, the premium can be higher. After this information has been provided, you should be in a position to obtain the most accurate quotation for your building. Why do managing agents use insurance brokers? 1 – Access: Insurance brokerages have established relationships with insurance companies meaning that you have not only access to 1 quotation but an entire market. Great news when you have to justify the service charge spend! 2- Ease: following on from the above point, we all understand that being a Director of a Residents Management Company is a part time, voluntary role and therefore efficiency is key. The last thing you want is to be making hours of phone calls and emails to sort out an insurance policy. So long as you have the information we have mentioned above then you can let the brokerage do all the running. 3 – Cost: contrary to popular belief, insurance brokers do have access to specialist underwriters and therefore they can actually obtain quotations for you that you may otherwise not have access to, and we all like value for money don’t we! So we have informed you what your landlords building insurance policy covers, how to get the best insurance policy and the reasons to use an insurance brokerage. Now we want to inform you of how to make a claim once you have your policy in place. How to make a claim on the landlords building insurance policy? 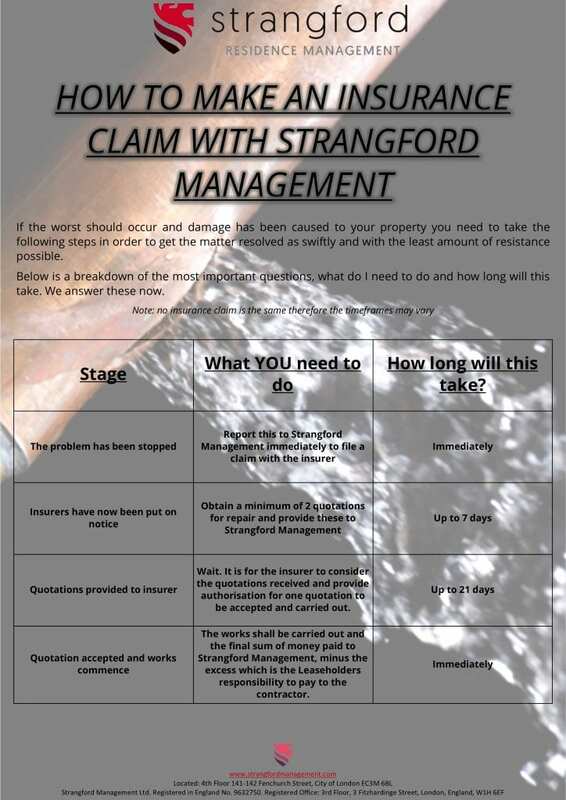 So now we have told you everything you need to know about landlord building insurance, the next step is for you to contact Strangford Management, providing leading block management London, we can help reduce the cost of your building insurance premiums today.